Home › Wedge-tailed shearwater › Flesh-footed Shearwater - Ardenna carneipes. The flesh-footed shearwater (Ardenna carneipes) is a seabird belonging to the family Procellariidae. The flesh-footed shearwater ranges across, Indian ocean, Pacific Ocean and Arabian Sea. The shearwater breeds on islands off Australia and New Zealand. 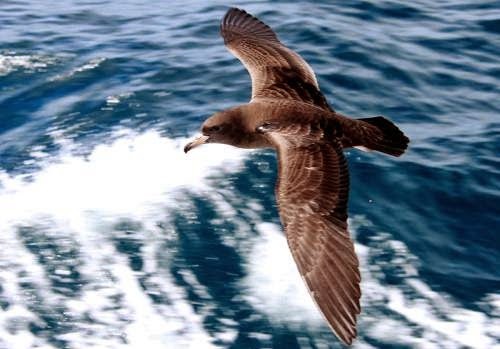 The International Union for Conservation of Nature (IUCN) had categorized and evaluated these shearwater species and had listed them as of 'Least Concern'. These birds are medium sized, measuring 40 to 50 cm in length and weighing 500 to 775 grams. They have a wingspan of 100 to 115 cm. They have blackish brown plumage. The feet are pale pink and the bill is pale yellow with distinct black tip. These birds breed in colonies and breed during September and November. Current topic in Birds of India: Flesh-footed shearwater - Ardenna carneipes.